We had the pleasure of meeting this fine band last night at Tree House Lounge in DC, but unfortunately we were a little late and missed their set. 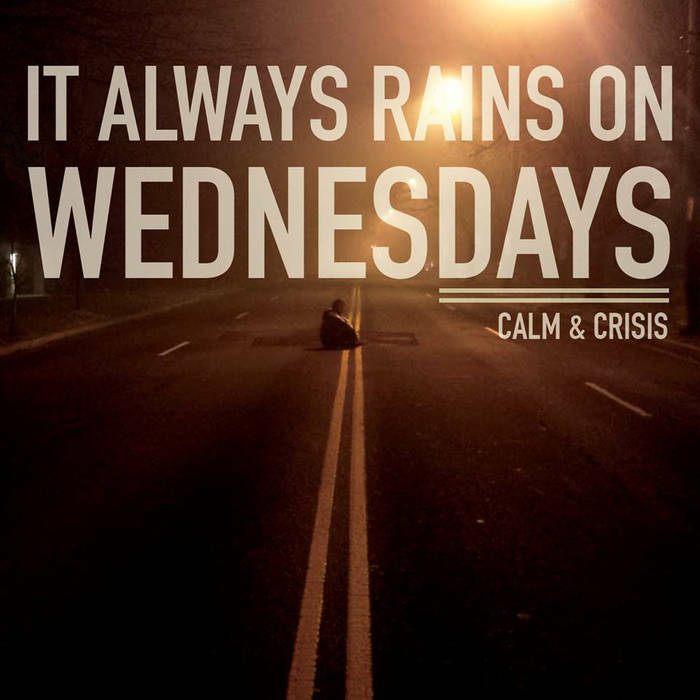 Luckily for us, It Always Rains On Wednesdays is here to give us a taste of what we missed out on. The blur opens strong with some subdued guitar work underneath a powerful bass line. Any album with a great bass mix like this one can really make a difference in elevating the sound. I’m reminded a lot of bands like My Morning Jacket and early Modest Mouse. The drumming here is solid and steady, keeping the flow while also adding a unique touch. In lieu of a guitar solo, there’s a bass solo near the end. That’s a rare thing in this style of music, and I must say I appreciate the innovative songwriting of Calm & Crisis. In Vain starts of with some dark acoustic plucking, I love that sound. The dynmanics here are fantastic, the build from soft to heavy really makes this stand out. Two songs in a row so far that mention drinking whisky, I’d recommend having a shot or two to really get into the mindset Calm & Crisis were in while writing It Always Rains On Wednesdays. Still has a very big sound. Effected vocals, subtle background effects that lead into a powerful chorus make it hard not to love this song. Calm & Crisis really show what a versatile band they are here, capable of combining reflective musings with raw aggression. The closer, Small Pond brings it back down. The whisky is flowing in the lyrics of this song, but it adds something great: it’s honest. Brutally honest, genuine emotion. We live in a world where people like to get fucked up. At the bars and shows we attend, there’s always a sense of community in our collective desire to dull our senses a bit and let go of all the little things that are holding you back from feeling good about life. It’s a song about experience, and an album about life. If you’ve even been drunk, angry, sad, broken, or lost in your own mind, do yourself a favor. Check out this album.